South Coast goodness is featured in this month’s Country Style, including the wonderful John Evans of SOUTH on albany! 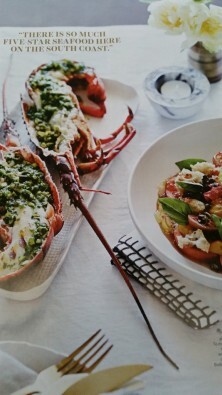 Across seven pages (starting on page 50) you can enjoy some of John’s recipes featuring local seafood. Congratulations to John, Sonia and their wonderful team at Berry’s SOUTH on albany who were awarded one chefs hat at the Sydney Morning Herald Good Food Guide 2016. This wonderful local restaurant showcases local produce and seasonal ingredients and it’s one of our firm favourites. Congratulations and well deserved! SILVER at the Regional Tourism Awards! We were really chuffed to have been awarded Silver in our category of Tours and Transport Operators at the recent South Coast Regional Tourism Awards. The winner in our category was the long established and excellent Dolphin Watch at Jervis Bay, so we figure we did pretty well! And apparently there was a record number of entries in this year’s awards and it was a very competitive field. Wow. We send out our thanks to the many friends of Foodscape who have offered messages of congrats and support. It was really exciting to receive! We were pretty excited to find out that we are Finalists in this year’s South Coast Tourism Awards. We got a note to say… “Congratulations! 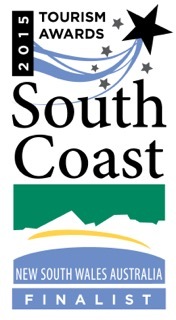 Foodscape Tours has been named a finalist in the South Coast Tourism Awards in the Tour and/or Transport Operators Category and the Tourism Small Business Operator Category”. Winners will be revealed at an awards dinner in Ulladulla on Wednesday 26 August. Wish us luck! The 2015 Olive Harvest has begun! 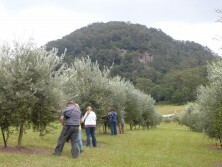 What a wonderful day we had on Saturday 21 March at Kangaroo Valley Olives HQ. It was our inaugural Foodscape Tours olive harvest event and it was a fabulous day. The harvest team was made up of both locals and visitors (including Patti who was here from the US for work!) and also food writer Liz, and Peter, who form the team at Bizzy Lizzy’s Good Things. Last year I was super excited to be given a personally signed copy of a cookbook by Indian celebrity chef Sanjeev Kapoor. Well… to add to the excitement, I recently got to meet Sanjeev in the flesh. Sanjeev has been in Australia quite a bit of late, given his role as an ambassador for Tourism Australia’s ‘Restaurant Australia’ campaign. However more recently he was here for personal reasons to celebrate the 25th wedding anniversary of his sister-in-law – who happens to be my friend! 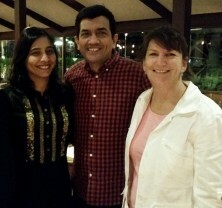 I got to meet him at one of the family celebrations marking the occasion and couldn’t pass up the photo opp – so here it is, me with Sanjeev and his lovely wife (and my friend’s sister) Alyona. Part of our busy-ness in Spring was due to preparations for the small part we got to play in the Restaurant Australia campaign. This Tourism Australia initiative saw over 80 food influencers – chefs, bloggers, journalists etc – from around the world descend on Australia in November. 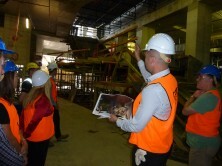 Visiting all states we had a number of these influencers tour regional NSW including the South Coast. We helped host French foodie, Anne Anne Latillade fom the blog Papilles et Pupilles and also helped with the locations selected for Chinese TV program ‘Follow The Master’ with celebrity chef Yifan Liu. Both dined at Wharf Rd in Nowra, with Anne also visiting Salvatore’s Smokehouse to try our smoked south coast oysters, and then South Coast Providores; while Yifan’s crew filmed at Schottlander’s Wagyu and sampled milk and gelato at The Pines, Kiama. For Sydney based tea lovers – the Sydney Tea Festival is on tomorrow, Sunday 17 August, at Carriageworks, 245 Wilson Street Eveleigh. A celebration of all things tea, you’ll find more than 40 stalls offering everything for the ritual of tea making – from loose-leaf brews to tea-ware and accessories. 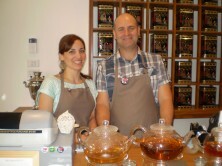 Amongst the stallholders you’ll also find our lovely friends from The Berry Tea Shop. The Sydney Tea Festival is an interactive experience designed to help people discover and experience specialty tea, encourage and grow passion for tea through education, and showcase quality specialty tea providers. The festival day has two elements – a free tea market and a program of ticketed workshops. 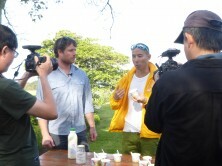 We had another run on Sydney Weekender recently, this time showcasing our ‘Tastes of Saddleback’ Foodie’s Indulgence tour. 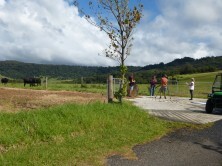 Host Mike Whitney enjoyed giving the cattle backscratchers a run at Schottlander’s Wagyu farm in Rose Valley (Gerringong) too. You can check out the clip here if you missed it on the weekend. The Kiama and Shoalhaven regions have so much to offer and we are only a 2 hour drive from Sydney and a tad further from Canberra. We even have Foodscapers from Wollongong who enjoy coming a little further south and enjoying some time out in their own backyard. What a way to spend an afternoon and evening. Thanks Cam, everyone had so much fun. I can’t recommend you highly enough. You made the afternoon and evening easy, picking us up and dropping us off home in one piece. Sorry about the singing & light fingers! The Butter Factory was amazing. Hopefully we can all come back to the area again one day soon. What an amazing tour! Excellent way to explore Berry & surrounding areas. It was very organised and a variety of things to see and do- chocolate, gelato, cheese, wine, oysters & a very nice lunch with beautiful views. Cameron our tour guide was very friendly from start to finish. We all had a great time. I would highly recommend this tour to anyone. Thank you for making our weekend so memorable!